Alphabet subsidiary Loon has announced it’s partnering with Telkom Kenya to bring internet access to remote regions of rural Kenya. With the new partnership, Telkom Kenya will provide the internet signals, and Loon will help those in remote areas of Kenya gain access to those signals. Kenya’s authorities are hoping that the technology can help the country achieve full internet coverage. The key to the partnership is Loon’s antenna-outfitted balloons. The polyethylene balloons are about the size of a tennis court and are powered by a solar panel. Designed to stay aloft for months at a time, each balloon’s antenna can extend coverage of internet signals over an area of 5,000sq km. This kind of technology is imperative in a region where the vast distances between inhabited areas make laying cables impractical. 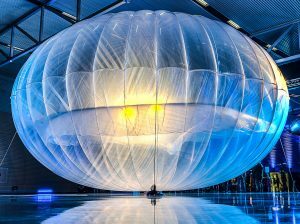 The goal of the new partnership is to deploy network of giant balloons above parts of the African country high enough to be out of range of wildlife, air traffic, and storms. The balloons move by surfing semi-regular wind channels, letting the company maneuver the balloons into the areas where they are needed. The companies aim to start the deployment next year. Alphabet’s Loon subsidiary was originally known as Project Loon and was part of Google’s experimental division, X. The business became a fully-fledged subsidiary earlier this month. The deal with Telkom Kenya is its first commercial agreement. The specific terms of the deal have not been disclosed and there has been no firm timeframe for deployment announced. While the Kenyan government appears to have thoroughly embraced the plan, some critics have voiced concerns. The most vocal complaints are about the wisdom of building a reliance on commercial, foreign technology for something as critical as connectivity. There are also concerns that the partnership could lead to a communications monopoly, since there is no viable competition currently available. However, most seem to feel that having some connectivity in the rural areas is better than having no connectivity at all.